October 12th, 2017: Talking Tiny at the BookRack in Newburyport, 52 State Street. Vera and the Silver Bullet Tiny House was at the festival where she spoke about her sustainable tiny life with passion and humor. American USA Tour finishes June, 2017 logging 17,283 miles for the Silver Bullet Tiny House through 32 states. Workshops, tours, speaking engagements inspired and motivated thousands of tiny house enthusiasts, environmental activists, climate change educators and carbon footprint mitigators. Earth Day Texas, April 21-23, 2017. Vera was the Renogy Solar Ambassador to Earth Day Texas is the largest global Earth Day event and takes place at Fair Park, Dallas, Texas, 10AM to 6PM each day. 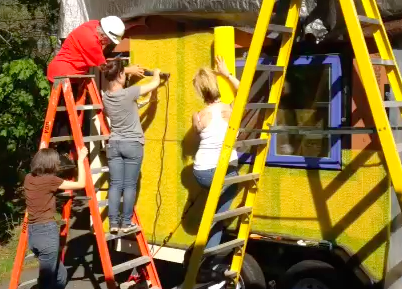 She provided tours of her zero-waste, all clean energy, solar powered Silver Bullet Tiny House. Vera Struck, who designed and built a simple, off-grid, sustainable life style, spoke about her tiny house journey and build are which are available in her sustainable e-book, ‘Living the Sustainable Tiny Life’ (discount code is available to attendees). September 16-18th, 2016: The Silver Bullet Tiny House goes up to Derek Diedricksen’s Summer Camp 4 to be toured by attendees. June 11- 19th Tour/Workshops at the Klay Winery. Registration and information here. Come to the beautiful Laurel mountains, 65 miles SE of Pittsburgh, PA. and learn all about tiny houses on wheels. Take a 30 minute tour of the charming Silver Bullet Tiny House, by designer, builder, artist and author, Vera Struck for $15. You will discover repurposed and reclaimed resources, renewable energy systems, a zero waste, off-grid tiny house on wheels made from sustainable non-toxic materials. For the serious tiny house enthusiasts we recommend the 3 hour workshop $75., where you will learn tiny house building systems, tiny house decisions about trailers, materials, building design, parking, zoning, etc. 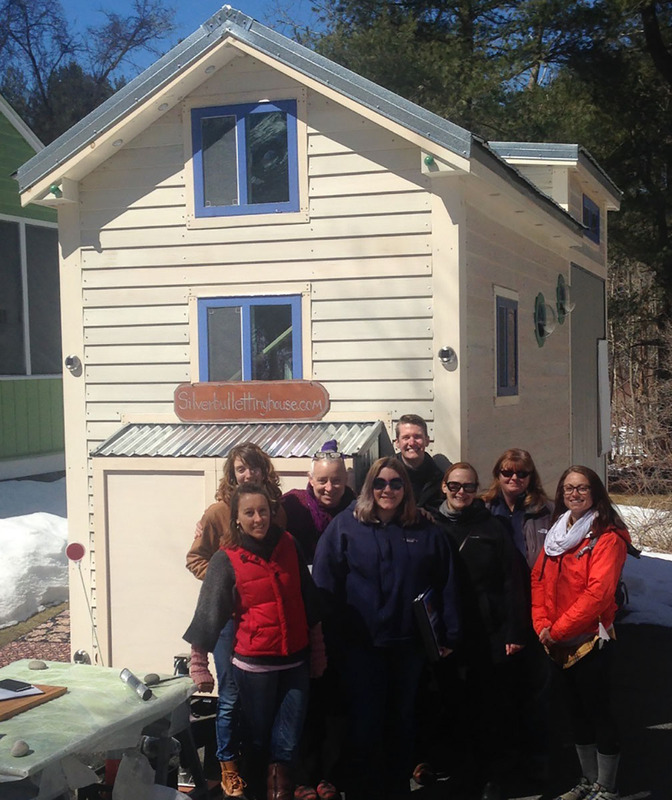 Nine attendees learned all about the Top Five Decisions before transitioning into tiny house living while enjoying the stories of the Silver Bullet Tiny House build. Building envelopes, systems, parking, zoning and towing a tiny were discussed in detail. Nov. 4, 2015 Keynote Speaker for “Poverty Matters” Group, Newburyport, MA. October 25, 2015 Our 9th Workshop! Twelve attendees learned all about the Top Five Decisions before transitioning into tiny house living while enjoying the stories of the Silver Bullet Tiny House build. Building envelopes, systems, parking, zoning and towing a tiny were discussed in detail. 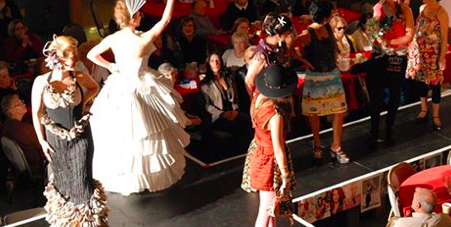 Our Founder, Vera Struck, created two new eco-couture fashions for another sustainable education non-profit, Long Way Home, that was featured at the renowned Rubbish to Runway Refashion Show! Her gowns raised over $1,000 to help build a cistern at Long Way Home’s Guatemalan sustainability school. Our Founder, Vera Struck, spoke about the top five considerations before building a tiny house and about her personal journey at Derek “Deek” Diedricksen’s Vermont Tiny House Summer Camp, along with other tiny house luminaries. August 7-9, 2015: the 1st International Tiny House Jamboree Our Founder, Vera Struck, was a speaker at the 1st Annual Tiny House Jamboree, August 7-9th, in Colorado Springs! She spoke about her personal 5 year journey to “Living the Sustainable Tiny Life”, her newly released book and building the Silver Bullet Tiny House as a classroom module for sustainable living. Our 8th Workshop! 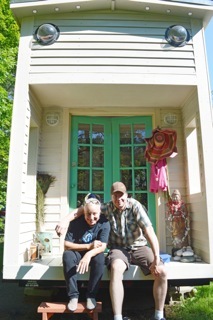 The Tiny House Journey Newbury, MA. Trailer modification, design process, framing, sheathing, downsizing transitions, insulation and energy systems will be covered. Includes light refreshments, building samples and 30 minute Q&A session. Bring your sense of humor! Our Founder, Vera Struck, created an eco-couture fashion for another sustainable education non-profit, Long Way Home, that was featured at the renowned Rubbish to Runway Refashion Show to help build a school at Long Way Home’s Guatemalan sustainability school. Sponsored and underwritten by the sustainability non-profit, terrabluteams.org, the first Silver Bullet Tiny House Social/Retreat empowered attendees with more advanced building skills as well as empowering them with tools to enable best “sustainable practices” in pursuit of a more sustainable tiny life. Particpants honed their new construction skills building a simple vermi-composting shed from recycled horticulture pallets, a few Simpson ties and leftover building supplies. Several 2nd-3rd stage tiny house construction projects such as rain screen installation, interior design, water catchment systems were implemented. Local organic dinners from the garden were included, fire pit socials, barter skills, and trash to treasure projects were enjoyed. Sponsored and underwritten by the sustainability non-profit, terrabluteams.org, the first Silver Bullet Tiny House Social/Retreat empowered attendees with skills and information about choices required to approach a more sustainable tiny life. Particpants honed their new construction skills building a simple worktable needed for their future tiny house builds, installing 2nd and 3rd stage projects such as window installation, rain screen application, vented roofing and insulation, and how to turn trash into treasure. Attendees made earrings of recycled plastic in their own custom design. Sunday morning after a leisurely breakfast, folks were guided into yogic meditation by Kelsey Max Klibansky. September 9 – October 30, 2013: Reclamation Art Show where our Founder, Vera Struck, collected her waste-stream for a year and repurposed it into exquisite art! More information on the artist here. July 15, 2013: Founder begins building a sustainable net-zero model classroom for 2014 tour, check her progress at silverbullettinyhouse.com. 2. Wayne Castonguay, Ipswich Watershed’s Executive Director, informs us of the watershed’s assets; its trails, the river, its classes and his vision for the watershed’s future. You can watch this and older episodes by typing Getting Engaged into the ICAM website search box here. Introduction of the Getting to Zero Project and the benefits to a Massachusetts community like Ipswich. The presentation was a great success with almost unanimous support for the project being brought to Ipswich, Mass! Community leaders, selectmen, residents and advocates want our first GTZ project in their neighborhood! 9/19/2012: 5th Episode of the co-produced monthly TerraBluTeams/ICAM cable show entitled “Getting Engaged”, Sustainable Living for You, Your Community and Workplace featured two exemplary sustainable local organizations, New England Biolabs and Ebsco Publishing, where sustainable best practices are embedded in the employees DNA. You can watch this and older episodes by typing Getting Engaged into the ICAM website search box here. 6/20/2012: 4th Episode of the co-produced monthly TerraBluTeams/ICAM cable show entitled “Getting Engaged”, Sustainable Living for You, Your Community and Workplace featured Ipswich resident, David Temple of People Powered Machines, gives composting/mowing tips and the Tim Henry who gives Ipswich residents tips on energy rebates, free audits, etc. You can watch this and older episodes by typing Getting Engaged into the ICAM website search box here. Thanks to all Participants!!! There are a few gift certificates that remain, check out Support Us. 3/21/2012: 3rd Episode of the co-produced monthly TerraBluTeams/ICAM cable show entitled “Getting Engaged”, Sustainable Living for You, Your Community and Workplace featured interviews with Ipswich River Watershed Association Director, Kerry Mackin, a River Hero, water collection tips from Ipswich residents and a visit to the Ipswich water utility. You can watch this and older episodes by typing Getting Engaged into the ICAM website search box here. 2/15/2012: 2nd Episode of the co-produced monthly TerraBluTeams/ICAM cable show entitled “Getting Engaged”, Sustainable Living for You, Your Community and Workplace featured interviews with Ipswich Utilities Director, Tim Henry, more sustainable tips from Ipswich residents and Ipswich people on the street segments. You can watch this and older episodes by typing Getting Engaged into the ICAM website search box here. 1/19/2012: Thursday, 6:30PM- TerraBluTeams introduced it’s educational concepts and mission to Ipswich, MA residents at Zumi’s Coffee Shop, 40 Market Street, Ipswich, MA. Our four educational vehicles were explained to the community with an excited response. Engaging and lively discussion ensued! 1/18/2012: Wednesday, 7:30PM The Premiere of the co-produced monthly TerraBluTeams/ICAM cable show entitled “Getting Engaged”, Sustainable Living for You, Your Community and Workplace aired: watch the first 30 minute monthly episode on youtube here. Featured are Zumi’s Cafe, the Ipswich Delaney-Johnson family and Brick Ends Farm. You can watch this and older episodes by typing Getting Engaged into the ICAM website search box here. 1/11/2012, Wednesday, 8:00-9:30PM – As Vice Chair of the North Shore Technology Council’s Women’s Initiative, our Founder partnered with the NSTC Sustainability Forum and brought you a Sustainability Forum about Human Capital Engagement: Use it or Lose it! Current and former clients include Seventh Generation, Radio Flyer, The North Face, Timberland, Stonyfield Farm, Nike, US EPA, NRDC, Business for Social Responsibility, and Unilever. Practically Green is the winner of the 8th Global William James Competition Awards Competition. Susan has a BA from Wesleyan and an MBA from The Tuck School at Dartmouth College and serves on the boards of Xconomy and the Center for Women & Enterprise. Emily writes a blog, EBSCO Sustainability, as well as a weekly sustainability newsletter. She is also involved with EBSCO’s Green Team. 11/21/2011 9AM – 12 Human Capital Engagement: Use It or Lose It!, Keynote, Hesser College, Salem, NH.